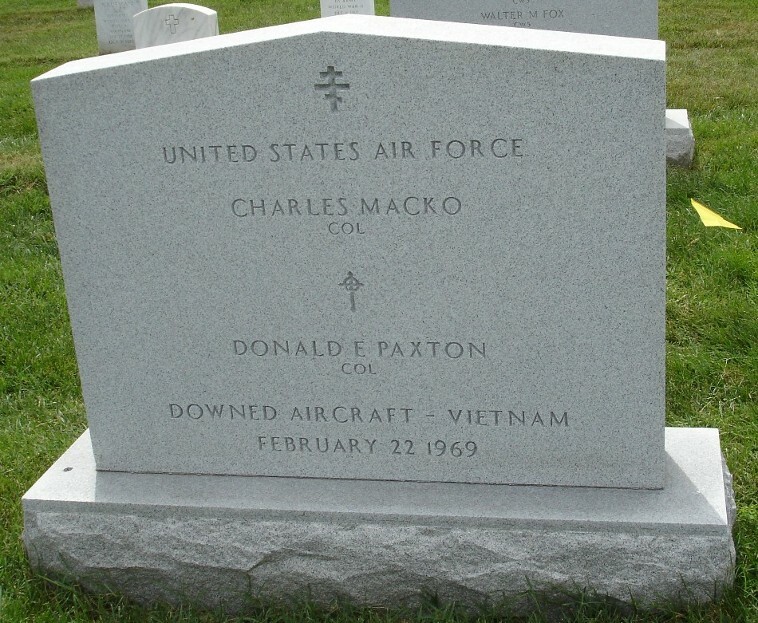 Charles Macko was born on January 15, 1931 and joined the Armed Forces while in Endicott, New York. He served in the United States Air Force, 8 TBS 35 TFW, Regiment 1ST SP OPS, and attained the rank of Colonel. Donald Elmer Paxton was born on October 3, 1928 and joined the Armed Forces while in Cedar rapids, Iowa. He served in the United States Air Force, 8 TBS 35 TFW, and attained the rank of Colonel. Tiger. The Canberra was sometimes used in conjunction with other, more sophisticated aircraft, such as the C130, and was especially effective on night missions. 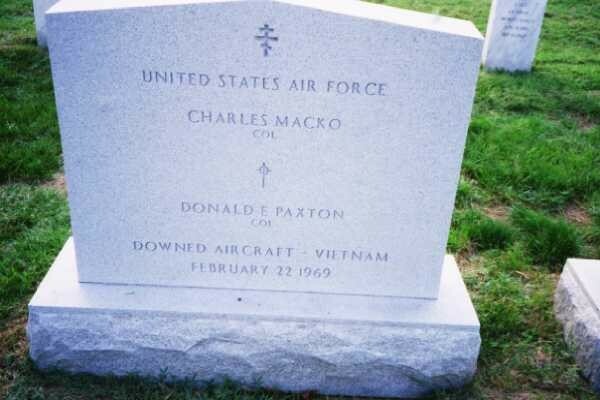 Lieutenant Colonel Donald E. Paxton and Major Charles Macko were in Laos. Paxton was the pilot and Macko the co-pilot of a B57 bomber sent on a mission over Savannakhet Province, Laos, on February 22, 1969. During the mission, the aircraft was shot down and both men were declared Missing In Action. Laos would be released in Laos, hoping to gain a seat at the negotiating table in Paris where the U.S. and Vietnam were negotiating an end to the war. The U.S. did not include Laos in the Paris Peace Accords, and no Americans held in Laos were released. In America's haste to leave Southeast Asia, it abandoned its finest men. Since the end of the war, the U.S. has received thousands of reports convincing many that hundreds of Americans are still held captive today. In seeming disreguard for the Americans either held or having been murdered by the Pathet Lao, by 1989, the U.S. and the Lao devised a working plan to provide Laos with humanitarian and economic aid leading toward ultimate full diplomatic and trade relations while Laos allows the excavation of military crash sites at sporadic intervals. In America's haste to return to Southeast Asia, we are again abandoning our men. Charles Macko and Donald E. Paxton were both promoted to the rank of Colonel during the period they were maintained missing. The number of Americans missing and unaccounted for from the Vietnam War is now 2,005. Today, the Department of Defense released the names of eight of nine US per sonnel now accounted for, six previously missing in Laos and three inVietnam. These Americans include Commander Leonard M. Lee of Virginia and Lieutenant Commander Roger B. Innes of Illinois, both US Navy, missing in North Vietnam since December 27, 1967. The Defense Department did not publicly release Commander Lee's name at the request of his next-of-kin; however, members of Commander Lee's family were quoted in the Richmond Times-Dispatch September 4th edition regarding his identification. Others include Lieutenant Colonel Donald E. Paxton of Iowa and Major Charles Macko of New York, both US Air Force, missing in Laos since February 2, 1969; Captain Stephen P. Hanson of California, 1st Lt Jon G. Gardner of North Carolina and Sgt Timothy R. Bodden of Illinois, USMC, and Army GySgt Billy R. Laney of Florida, all missing in Laos since June 3, 1967; and Army CWO1 William A. Smith, Jr., of Michigan, missing in South Vietnam since September 2, 1968.